The first episode of Survivor: Panama: Exile Island aired last night. This season the gimmick is they've split the 16 contestants into four tribes to start out: older women, older men, younger women, and younger men (more on this later). After each reward challenge, the losing team has to leave one member behind to spend the night alone on Exile Island. The upside to this is that supposedly there is an immunity idol hidden on the island. Anyhoo, after five years and a dozen locations, Survivor is still your best destination for reality television. Oh I'm sure a lot of production-y stuff goes on behind the scenes, but toward the end of those 39 days, the contestants are beat-up, weathered and hungry. Some look downright emaciated. That's real. But you know what would be even more real than Survivor? Survivor in HD. Since I picked up my first HDTV last summer, I've been gratified to find more and more HD programming available. Surely Survivor would be jumping on this bandwagon soon? It seems like such an obvious candidate. The beautiful, exotic locales are one of the major draws to the show. Witness the abortive attempts to go inland (Survivor 2 - Australia, Survivor 3 - Africa), followed by nothing but tropical island locales ever since. I have been eagerly awaiting the debut of Survivor in all its high-def, widescreen splendor. 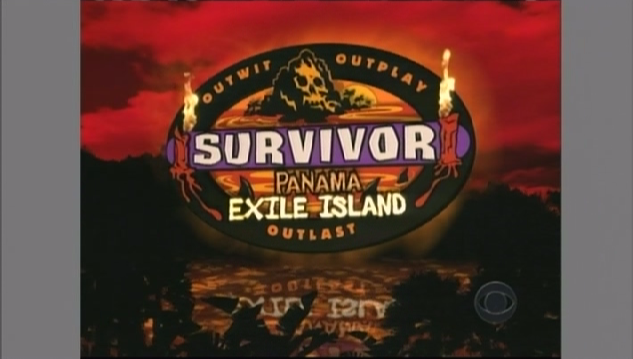 Last night, to my great disappointment and consternation, the twelfth season of Survivor opened in dreary old 4:3. I've Googled this topic and the consensus seems to be that since HD video cameras are much more expensive than regular ones, and since Survivor cameras are inevitably exposed to a great deal of salt water and sand, Survivor in HD ain't gonna happen anytime soon. Well, to that I say, shenanigans! I have no doubt CBS can afford to replace one or two HD cameras a season, if necessary. Hell, that's probably less than the revenue they make from one 30-second commercial. Finally, I think this guy said it best when he argued, "Its been said before, but if Discovery can haul their HD equipment out to the desert so I can watch an elephant take a poop in high def or follow the Snakemaster all over the amazon, then CBS should be able to do the same for Survivor." Don't tell me they can't make this happen. Come on, CBS, get with the program! I was really trying to sell the appeal of the show above in order to make my argument, but I have to say this latest cast looks pretty weak. The four older men looked the strongest out of the gate, having a good combination of strength and intelligence. The four younger women lost the first reward challenge, but made up for it with a decent showing in the immunity challenge. The older women are helpless, having voted off their only competent member last night. But the really amazing team is the younger men, and not in a good way. These guys looked completely incompetent during the physical immunity challenge, barely managing to beat out the older women. When they finally crossed the finish line, two of them were actually bleeding. How did that even happen? I also don't see a lot of interesting personalities to create drama, but maybe it's just too early to tell. I do see promise in one older guy who made the questionable decision to leave behind a 3-packs-a-day smoking habit to come on the show. After going barely more than 24 hours without a cigarette he looked about ready to kill someone with his bare hands. 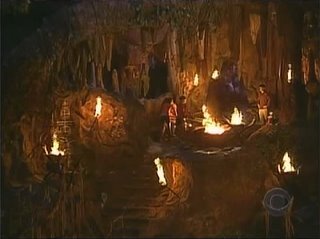 The tribal council looks really cool this time around. It's like a bat cave! I love Survivor. I'm so pissed I missed it last night (although, I'm pretty psyched that I learned Flash video during that time). The grey bars: You actually want this on your TV. It makes sure all your pixels are aging equally. If you were to watch a ton of 4:3 content with black bars, you eventually would see some ghosting. If you're like me, the majority of what you watch/play is 16:9 by now, so you probably have nothing to worry about. If it bugs, you should be able to go into the settings on your cable box and change how it outputs 4:3 material and then go into your TV and tell it what color to make the bars. 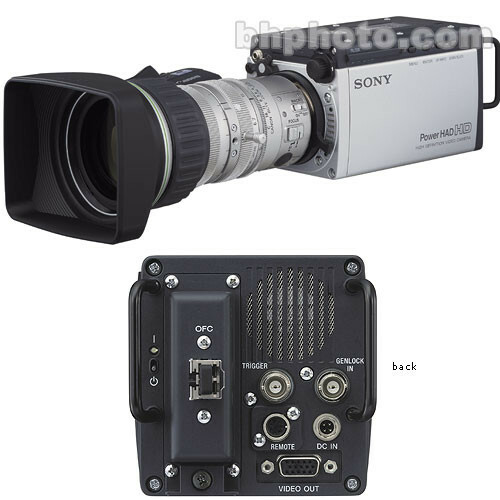 HD Cameras: Have you ever noticed how you NEVER see a camera man or crew member in Survivor? It's because those cameras they're shooting with are TINY and they're running around to get out of each other's shots. I saw the latest in HD equipment at Sundance Film Festival last year. They're getting smaller, but they're not there yet. When Discovery hauls that HD camera into the desert, they're still putting it on a tripod. Good answer, thank you. Although with a DLP I don't think my pixels "age," unless you consider the litle actuators on the mirrors wearing out. But that explains why they do it for other HDTVs. Have you ever noticed how you never see a cameraman or a crew member in any TV show? It's called editing. Don't defend those guys. I want HDTV and I want it now.